It’s always freezing at my office. I always have to wear a shawl. 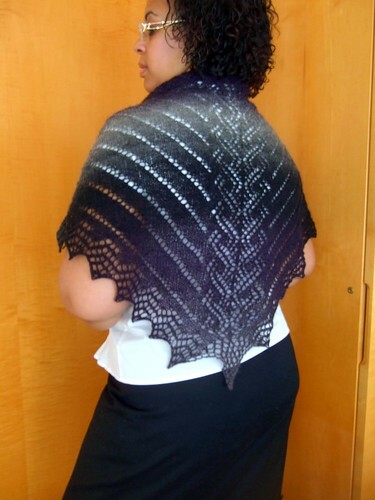 Said shawl usually has to be conservative, particularly when we are expecting clients. 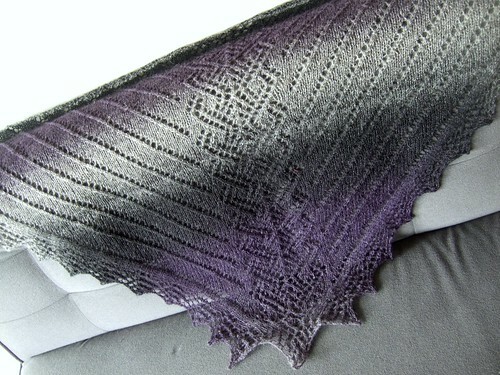 When I saw this Kauni colorway, I KNEW it would be perfect for this type of shawl. 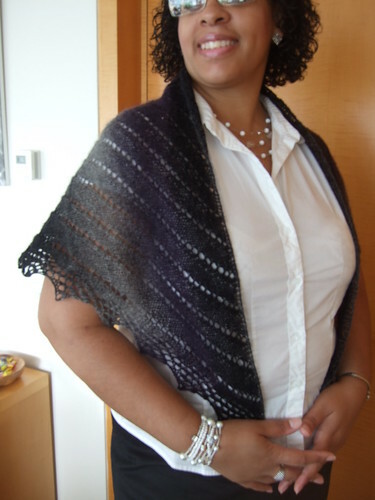 This is a quick and easy design you can knit until whenever you feel like stopping, run out of yarn, or just feel the shawl is the perfect size. Yarn: Kauni Effektgarn 8/2; yardage varies on skeins of this yarn. 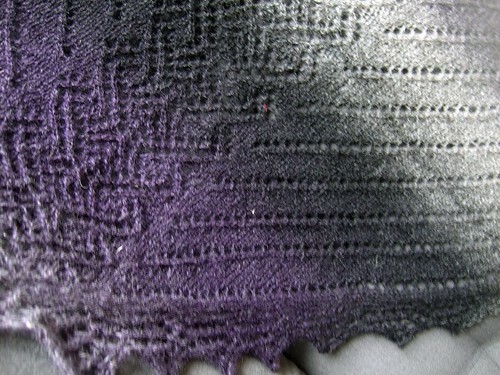 The model shown used 446 yds of the ET colorway, purchased from Little Knits. Oh, wow – it’s stunning!!! The soap was a big hit this weekend, by the way. Thank you again! Ooo! Very nice! I was wearing Lily today at the office. Menopausal freakin’ meadows there. The Menopausal Mamas crank up the A/C because hey, they’re the one person out of ten that’s hot. Why shouldn’t they have 100% control of the thermostat? I can’t wait til we move to Newark. I swear I shall never ever be one of those Meno-mamas that force my hormonal swings on others when my time comes. But back to your shawl–very nice!! I’ve never seen such a subdued Kauni color. it’s gorgeous!! I would like to try it. We just finished using the soap and it was heavenly! Thanks again for the lovely package. It’s gorgeous! Now I can see all the colors in the yarn and wow. I’m loving it! Wow that’s so pretty. It’s always cold in my office too. How ironic that I wore a shawl yesterday. Wow, that is beautiful and I could have definately used one today at work. Yet another pattern to add to my wish list. I still have to purchase the yarn for my last purchase from you. Ummmm, they got SOAP…And I didn’t? I am crying foul here, dude! 😥 I guess you call me chopped liver?